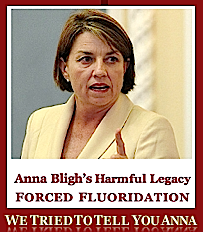 Fluoridation Australia | FLUORIDATION Letters # 1- 4 sent to Anna Bligh +. 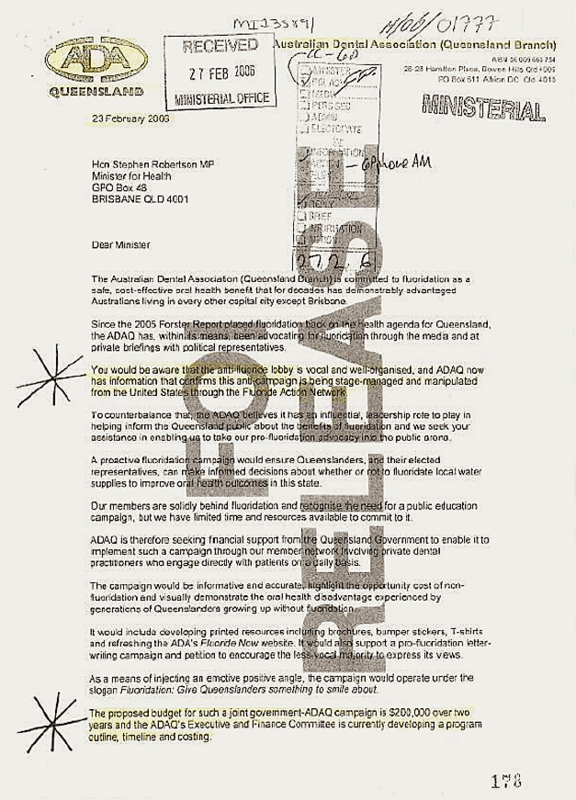 FLUORIDATION Letters # 1- 4 sent to Anna Bligh +. will supply them with clean drinking water. Copies sent to her electoral office and home address. We are ‘The Smart State’ for not having artificially fluoridated water. The majority of countries, either, avoided it, have banned it, or have ceased to fluoridate. In parts of India and China where it occurs naturally, it is removed from the water used for drinking. Are you aware of the political history of fluoridation in our state? Dr. Lew Edwards lost his safe seat due to public pressure because of his commitment to fluoridate the State of Queensland. Does your government know what the levels of hydrogen fluoride from pollution are in the air we breathe? Does the Queensland Government monitor fluoride air pollution? Do you know which industries pollute with fluoride? Do you know how much natural fluoride is in our drinking water at the moment? What are your proposals for recycled water? Are you going to re-fluoridate it? If you put recycled water through Reverse Osmosis equipment, which removes fluoride, what are you going to do with the redeemed toxic fluoride sludge? If you store fluoridated water in the dams you risk fish kills. Fresh water fish, bees, turkeys, some plants and animals are very sensitive to fluoride pollution. One part per million, is not a medical dose; it is a guide to industrial polluters. Dentists have been lobbied with endorsements, not scientific research. Long-term health problems have been ignored. See attachments ‘G, H, I,’ and ‘J’. What safe guards are you going to put into place to protect people who are super sensitive to fluorides? See attachment ‘L’ Death Certificate Brisbane Mater Hospital for Jason Burton – death by Fluoride poisoning + statement by mother and newspaper cutting. You have a duty of care, a responsibility to every person in the state. On the matter of water fluoridation we are directing you to do nothing. The people of Queensland want clean water not contaminated water. Keep Queensland ‘The Smart State’ by not having artificially fluoridated water. 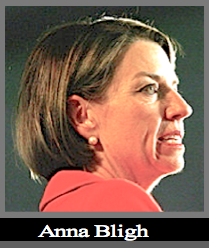 Our Letter #2 of 4 sent to Anna Bligh. While you were in China and India recently, did you enquire as to the state of the natural contamination of Fluoride (CaF2) in the water in those two countries? See our previous state of the nations report. Ottawa, Canada removed Fluoride from its water last month. Previous communications from your Department of Health have not addresses our questions. By not answering them are they deceiving us? Promotion by endorsement is not science and this is all we have received. History has shown this; doctors used to promote cigarettes! The FDA has just withdrawn its support for mercury in dental fillings. See below. The law you have passed on fluoridation does not permit you to add the heavy metals that are also in this industrial waste Hydrofluorosilicic acid, which contains up to 30 components including heavy metals. (See analysis below). It is the acid spray waste from the chimney pollution scrubbers, mainly from the fertiliser industry. Fluoride is usually 20% – 38% of the total compound. This industrial waste is not safe for human consumption. Fluoride is toxic and corrosive. It rates ‘four’ on a one to five scale – more toxic than lead, slightly less toxic than arsenic. While the uranium and radium in fluorosilicic acid are known carcinogens, two other products of uranium, even more carcinogenic are radon-222 and polonium-210, these are also present. It is illegal to release fluoride into waterways or the ocean. It seems to us, that someone needs to do some homework. You have been ill advised on this mater, your advisors seem to know very little about poisons, human health, and eco-systems. The laws of nature cannot be reversed to suit pleasure, profit or politics. It matters little how many millions of dollars are spent promoting this absurdity, it will not change the facts. Citizens have an expectation that their government will supply them with clean drinking water. We certainly do not expect it to be deliberately contaminated or medicated. People living in units cannot install tanks. Reverses osmosis filters are expensive, and waste a lot of water. The city water supply system must not be used as a medicine bottle and certainly not used for pollution dispersal. If you and your family drink fluoridated water, given the information we have provided to you, then you will be unwise. However, if you do not drink the fluoridated city water then you will be guilty of double-standards. No one goes through life without making mistakes, and often the mistake cannot be remedied. Fluoridation is a mistake and you can correct it. The American Kidney Foundation has recently withdrawn its support from sodium fluoride in the water and is urging other medical bodies to do likewise. The health of 4,000,000 Queenslanders is at stake. This was bad science and a bad policy from the beginning, we urge you change positions, and act quickly to stop fluoridation. fluoridation, on this matter it will not be so. this error, which you seem to so far have chosen to ignore. A little sole searching and goggling should have rung alarm bells for you. or one lead by an elected female premier. 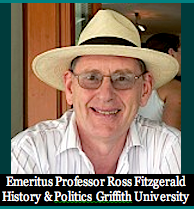 Dr. Lew Edwards who attempted to fluoridate the State of Queensland (1975), and several other politicians who originally put fluoride into the Gold Coast water supply many years ago (ceased July 1979). Even if you do install fluoride plants in various water systems throughout the state, they will be removed in the future. 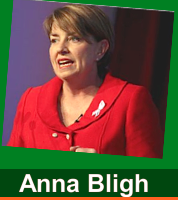 Our Letter #4 of 4 sent to Anna Bligh. We are concerned that you may not have tested the eighteen bores used to augment Toowoomba’s water supply for calcium fluoride – CaF2.F. levels. We are asking for the F. levels from each of these bores please. The attached maps, charts and photos (9 Pages total), from research carried out by the Queensland Government: (J.M. Harvey Chronic Endemic Fluorosis of Merino Sheep in Queensland. Q J Ag Sci 1952;9:1-88.) – These charts illustrate, calcium fluoride is present in Queensland’s underground water, and some of the illustrations associated its problems. Some of Queensland’s aboriginal settlements also use underground water and it needs testing for levels of calcium fluoride before you undertake artificially fluoridation programs of their water supplies. We request these figures too please. We wish to further remind you that indigenous people have smaller kidneys – a reduced number of nephrons and decreased renal reserve – (Singh G, White A, Spencer J, Wang Z, Hoy W ). Kidney health problems are more common for indigenous people than for non-indigenous peopleand they are therefore more at risk from fluorosis and other diseases associated with fluorides. We look forward to hearing from you within 30 days with proof of your action on these two issues. incompetent, blackmailed or lied to. This also happened in New York ! 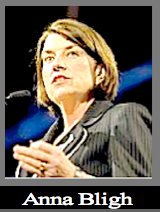 Anna Bligh has signed a personal guarantee that could cost the Premier her personal assets in a court battle if people become sick from water fluoridation, a Brisbane lawyer said. 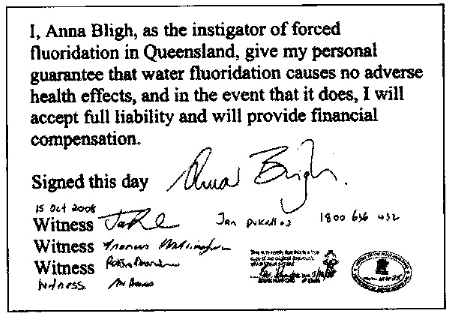 This week, Ms Bligh confirmed she had signed a legal document in which she accepts full personal liability for fluoridation and promises to provide financial compensation in the event that it causes adverse health affects. Fluoride was introduced into the state’s water supply in December. At the time, Health Minister Stephen Robertson was presented with two petitions totaling 6000 signatures against the move, which will see a final fluoride concentration of 0.6 parts per million. “The Premier signed the document as a demonstration of her commitment to fluoridation,” the Premier’s spokeswoman said. But the promise could provide a loophole for anti-fluoridation activists to take legal action over the rollout of fluoride. “You’d have to provide medical evidence the condition has been caused by consumption of fluoridated water and not another factor,” Mr. O’Connor explained. He said anyone bringing a case against Ms Bligh would have to show they had changed their behavior on the basis of the promise. “It’s an unusual case. I’ve never seen this done before,” he said. An article published in the respected medical journal Lancet said fluoride can cause nurotoxicity in laboratory animals, but hasn’t yet been proven to be toxic to humans. stop the Supreme Court of Victoria from hearing any public cases or evidence against artificial fluoridation. 1995 In Australia, the Tasmanian government passes a bill to prohibit the holding of meetings on the subject of fluoridation. Called the “Consequential Amendments Bill”, it is later withdrawn for rewording and reissue at a later date. He is the author of 33 books. 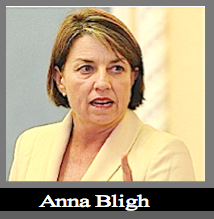 QUEENSLAND Premier Anna Bligh’s spectacular back-downs on recycled water and on the controversial Traveston dam project will not save her at the next state election. Not unless she shelves her plan to add fluoride to the drinking water. Those who think the introduction of fluoride is a minor issue should think again. It was, after all, a highway through koala habitat in southeast Queensland that ended the government of Wayne Goss. Fluoride will be added to Queensland drinking water just before the new year break. 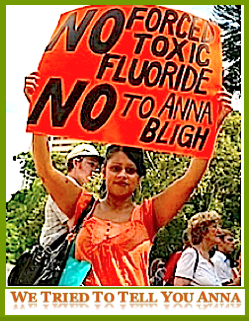 The problem for Bligh is that the citizens who vociferously rally against fluoridated water are part of the same group that was instrumental in denouncing recycled water. It’s issues such as these, where governments run roughshod over the electorate, that really bite. Bligh claims that most Queenslanders are in favour of fluoridation, but there is widespread scepticism, particularly among farmers, who have known for many years that some bore waters high in natural fluoride have a detrimental effect on the health of livestock. Chronic fluorine toxicity results from continuous consumption of fluorine while the sheep are young and teeth and bones are growing. The teeth become chalky white, mottled and pitted. The bone of the lower jaw thickens and bony outgrowths may develop. In some instances this can lead to lameness and fractures. Selling the message that fluoride is good for human consumption is a hard task in country Queensland, especially as the Department of Primary Industries warns against a consumption of 2mg a litre for sheep. This amount would be drunk by a farmer in a normal day’s work if the drinking water had fluoride levels proposed by the Bligh Government of 0.8 to 0.9 parts per million. During a visit to Queensland, Andrew Harms, past president of the South Australian branch of the Australian Dental Association, said the addition of fluoride to water in these mining towns would increase the uptake of lead by children and adults who already had gravely high lead levels in their blood samples. City folk may be a different matter, especially as a substantial number of Queenslanders have migrated from NSW or Victoria. This group is seemingly content with the message that they have better teeth than their next-door neighbours. The problem is that not all Queenslanders agree with the message and that many citizens are against any form of mass medication in the water supply. The Bligh mantra of “safe and effective” does not convince everyone and there is much evidence that contradicts the government line. In November 2006 the American Dental Association announced that baby formulas made up with fluoridated water should be avoided for infants younger than six months. The Australian Dental Association and the National Health and Medical Research Council came on line with similar suggestions: babies six months to a year should have only about 600ml of fluoridated water, increasing slightly as the child grows. Mistrust of government festers within a community that has started looking elsewhere for information. The Lancet medical journal and Scientific American put the cat among the pigeons with negative comments about water fluoridation and its effects on body systems. Add to that data from the national survey of adult oral health (2004-06), published in 2007, which showed no difference in the dental health of Queenslanders and people in other states. Some medical professionals have tried to stem the flow of indoctrination but have been ridiculed for their objections. A prime example is the highly respected Brisbane-based general practitioner John Ryan, who has postgraduate qualifications in nutrition and children’s diseases and in environmental medicine. What irritates him is the failure of the Bligh Government to tell Queenslanders of the NHMCR fluoride warnings to mothers with babies. “Where is the Government’s duty of care?” he asks. Ryan is angry that the Government would deceive the public about data from a much-publicised Townsville study. Oral health data was collected about children living in Brisbane (non-fluoridated) and Townsville (fluoridated). There was much publicity by the Government indicating a supposedly vast difference between the two cities. In fact, the study showed there was less that half a tooth difference. This, Ryan says, is an ancient and poor quality study, on which the media indoctrination largely is based. “We were so shocked by five very significant untruths told to the public by the Government,” he says. As a consequence, opponents of introducing fluoride into the water supply took the matter to the Criminal Misconduct Commission. The CMC indicated it was not within its brief and referred the matter back to Queensland Health. Eight months later it has still not responded. The primary aim of the new Queensland Safe Water Association is to inform metropolitan and country Queenslanders about the negative aspects of recycled and fluoridated water. The message is simple: the state Government is putting public health at risk. Adult Queenslanders do not have the worst teeth in Australia and babies should not be given fluoridated water. The Bligh Government has estimated that about 30 per cent of the population is not in favour of water fluoridation, so you can bet the number is much higher. In the state election due next year, the Liberal National Party led by the urbane Lawrence Springborg, who is opposed to compulsory fluoride, may well ride to power on the back of this debacle. Qld Health staff doctored tooth decay data used in decision to force fluoridation. This alert is to inform Queensland Members of Parliament and others, that Queensland Health staff have doctored tooth decay rates data used in the decision making process and the massive fluoridation advertising promotions. A delegation to the Queensland Premier, Health Minister and Chief Health Officer on the 12th Feb made them aware of this situation, however it appears that this is being ignored by the Premier and that Legislation that has its basis in fraudulent data will be rammed through Parliament on Tuesday 26th Feb.
Queensland Health also portrayed that the data is from 1996 when in fact it is from mid 1991 to 1992. Queensland Health have refused to acknowledge tooth decay data in permanent teeth from recent Queensland Children’s Dental surveys and refused to acknowledge tooth decay data from children’s permanent teeth measured at 12 years of age which is the international standard of comparison. Recent Tooth decay data from permanent teeth shows that Queensland compares favourably to other Australian states. There is no scientific evidence to show that water fluoridation results in 65 % less tooth decay as Queensland Health claimed. A major British Government commissioned review of water fluoridation done in 2000 by York University found that size of estimated benefit to be only of the order of 15% and additionally that the review did not show water fluoridation to be safe. Queensland Health staff have illegimately dismissed creditable scientific publications showing links with harm from Osteoscarcoma and other adverse health effects and also recommendations from the Centre for Disease Control that infants under 12 months of age not consume fluoridated water. Freedom of Information shows that a senior Oral Health advisor to the Health Minister had written in 2006 that there are no scientific studies to prove water fluoridation is safe. Queensland Health would have spent millions promoting “safety“ of water fluoridation in newspaper, radio television advertising, even in posters in public toilets, yet the 2008 Water Fluoridation Bill assures the Queensland Government blanket protection from liability. The Water Fluoridation Act 2008 will give ” protection from civil rights and remedies” to any person or corporation involved in water fluoridation. Unless Criminal negligence can be proved, no harmed person will ever be able to bring a case of harm against, or prosecute the State of Queensland, the Minister, any analyst, any official or any person authorized under the Fluoridation Act, or any Water Supplier. 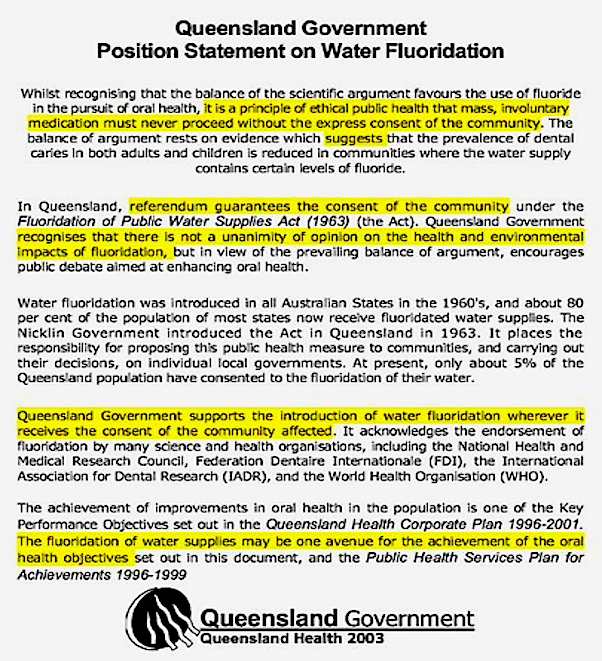 It is contradictory for the Queensland Premier to claim water fluoridation is safe, and then introduce Legislation that forces fluoridation on the population but also prevents any people harmed by it (even by accident) from making a claim against the decision makers or any person authorized under the Act. We urge the Members of the Parliament of Queensland to vote against this legislation which was based on and promoted by fraudulent data. Queenslanders Against Water Fluoridation Inc. The chemical most commonly used to fluoridate America’s drinking water is associated with an increase in children’s blood lead levels. Most studies that purport fluoridation’s safety and effectiveness in preventing cavities use the chemical sodium fluoride. However, most communities inject cheaper silicofluorides (fluosilicic acid and sodium silicofluoride) into their drinking water based on the theory that each chemical comes apart totally, so that freed fluoride can incorporate into tooth enamel. However, the silicofluorides (SiF) do not separate completely, as sodium fluoride does, As a result, water treatment with silicofluorides apparently functions to increase the cellular uptake of lead. In research published in the International Journal of Environmental Studies (September 1999), Masters and Coplan studied lead screening data from 280,000 Massachusetts children. They found that average blood lead levels are significantly higher in children living in communities whose water is treated with silicofluorides. Data from the Third National Health and Nutrition Evaluation Survey (NHANES III) and a survey of over 120,000 children in New York towns (population 15,000 to 75,000) corroborate this effect. Masters and Coplan reported that some minorities are especially at risk in high SiF exposure areas, where Black and Mexican American children have significantly higher blood lead levels than they do in unfluoridated communities. Lead poisoning can cause learning disabilities, behavioral problems, and at high levels, seizures, coma and even death, according to the U.S. Centers for Disease Control (CDC). Lead is a highly significant risk factor in predicting higher rates of crime, attention deficit disorder or hyperactivity and learning disabilities. “AWWA looks to the medical and dental communities, the U.S. EPA, the Centers for Disease Control, and other … organizations for their information and research on medical and dental health,” the statement said. …Stockin said the association has ignored obvious conflicts between the research and glowing reports on the safety of fluorides and will likely face lawsuits on behalf of kidney patients and other groups. He suggests other organizations immediately rescind support of fluoride. After years of asserting that mercury in fillings was safe, the Food and Drug Administration now says it may be harmful to pregnant women, children, fetuses, and people who are especially sensitive to mercury exposure. “Dental amalgams contain mercury, which may have neurotoxic effects on the nervous systems of developing children and fetuses,” the FDA now says on its Web site. The agency posted the revised assessment online Tuesday as part of a settlement with consumer advocates. The FDA also committed to issuing special controls on mercury fillings in July 2009. Those controls could range from giving patients information to adding warnings prohibiting use of the fillings in some people.